Is My Passport Still Valid? How can I get the Post-Brexit Blue Passport? Is the EHIC Health Card still Valid? Passport Advice & Services is proud to provide independent advice and services claiming no Passport Office or government affiliation, funding or accreditation as one of the UK’s leading providers in assisting British Citizens apply or renew for their UK passport through our optional value added services. With over 10yrs experience in the passport industry Submission Support, t/a Passport Advice & Services are leading experts in helping consumers secure a new passport as quickly as possible. We can help you secure an urgent appointment using Her Majesty’s Passport Offices’ Fast Track 1 Week or Premium 1 Day Appointment services or assist you with an urgent application by lodging and collecting it on your behalf. 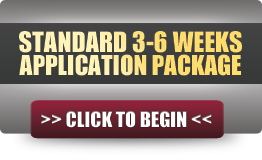 Third party assistance can also be provided to those looking to use the Standard Application & Renewal as well. 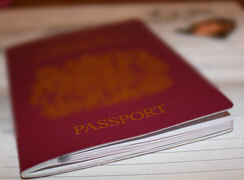 Whether this be your first passport or renewal, whether you be in the UK or overseas – we can help. As there are only seven Passport Offices in the UK, if you are unfortunate enough to live in Cornwall, Devon then we regret to inform you that you nearest Passport Office is in Wales. In previous years this would have meant that a consumer would have had to incur travel expenses, potentially accommodation expenses and take the time off work and to travel to Passport Office to secure a 1 day or 7 day passport. 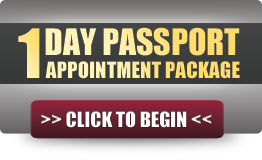 With our passport lodging service we save the consumer the hassle and provide a full “done for you” service. You simply post your documents to our head office and wait to receive the new passport sent via secure delivery days later. 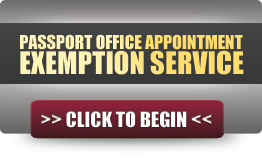 Select the Appointment Exemption Package to take advantage of this time and hassle saving service. 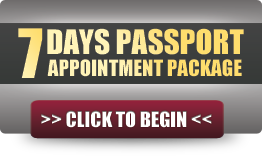 We understand that when you are travelling within days and you have an issue with your passport that prevents you from travelling that you need the appointment so that you can lodge an Emergency Passport Renewal as soon as possible. 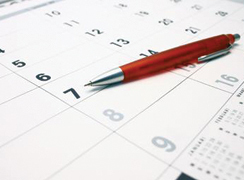 We also understand that some consumers are merely routinely renewing their passport or are not travelling urgently however because the Gov.uk service provides appointments to consumers on predominantly what is a “first come, first serve” basis applicants who are travelling urgently are placed behind those who are not travelling for many weeks and in many occasions can be flexible with when they lodge their application. 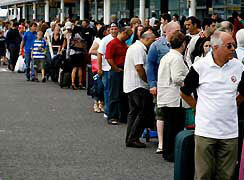 Passport Advice & Services operates an optional “needs based” Queue Jumping Service that can help you skip the queue. It can be a frustrating affair when you suddenly find that you need a new passport due to it being lost, stolen or expired and it becomes even more so when to use the Fast Track 1 Week or Premium 1 Day express renewal services the applicant either has to take the time off work and incur travel and accommodation expenses visiting one of the 7 Passport Offices operated by Her Majesty’s Passport Office in person or arrange someone else to do this for them. 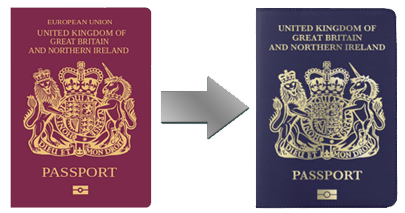 UKPassportServices.co.uk is operated by Submission Support Ltd, a Third Party Provider of Passport Advice & Services with no accreditation or connection with Her Majesty's Passport Office or the Government. 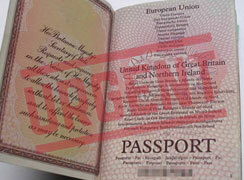 All fee's paid to us include the UK passport fee however we have no authority to issue British Passports. Our services & charges can be avoided at using Gov.uk. Thanks to your Priority Appointment service I was able to get an appointment and make my holiday when HM Passport Office said they had no appointments and would have to re-schedule the flight, thanks on behalf of my whole family! !